The Rev. Lino Otero is a man of faith who also has a deep interest in science. This week, his church opens an exhibit on a religious mystery that theologians, scientists and historians have debated for centuries: the Shroud of Turin. Actually, only a few diehard shroud worshippers find anything mysterious about this medieval forgery anymore. Anyone who has a deep interest in and a deep respect for science accepts the verdict reached by three independent sources —Oxford University, the University of Arizona, and the Swiss Federal Institute of Technology — that the cloth originated around 1350. The current exhibit on display at Otero's church in Sacramento, California, includes a replica of the shroud, a crown of thorns, and copies of whips allegedly used to scourge Jesus of Nazareth at his crucifixion. The exhibit also includes two holograms showing a three-dimensional image of a crucified man and a bronze life-size statue, which, according to Garza, shows how the body of the man in the shroud suffered. Since the shroud is a painting, there was nobody who suffered any kind of agony before being buried in it. Had Garza checked the proper sources, she would know this. Otero claims that "the exhibit is comprehensive," which is a lie unless 'comprehensive' means something other than comprehensive in church Latin. It is true that the exhibit includes panels explaining the scientific tests performed on it. But the display does not tell the whole truth. Garza writes that "in 1998, radiocarbon tests indicated the fabric dates to between A.D. 1260 and A.D. 1390. But Otero said other scientists have since shown that the sample used had been added later and was not part of the original cloth." It may be true that Otero said that, but what he said is not true. These scientists haven't "shown" anything. They've alleged. Raymond Rogers, a retired chemist from Los Alamos National Laboratory in New Mexico, claims that the part of the cloth tested and dated at around 1350 was not part of the original shroud. According to Rogers, the labs that dated the cloth to the 14th century tested a patch made to repair damage done by fire. How does he know this, since the patch was destroyed in the testing? According to shroud investigator Joe Nickell, Rogers "relied on two little threads allegedly left over from the sampling" and the word of "pro-authenticity researchers who guessed that the carbon-14 sample came from a 'rewoven area' of repair." According to Nickell, P. E. Damon's 1989 article published in Nature claims that "textile experts specifically made efforts to select a site for taking the radiocarbon sample that was away from patches and seams." Maybe that should be repeated for Otero and Garza: the textile experts who selected the sample piece for radiocarbon dating selected a site away from patches and seams. Rogers compared the threads with some small samples from elsewhere on the Shroud, claiming to find differences between the two sets of threads that “prove” the radiocarbon sample “was not part of the original cloth” of the Turin shroud. The reported differences include the presence—allegedly only on the “radiocarbon sample”—of cotton fibers and a coating of madder root dye in a binding medium that his tests “suggest” is gum Arabic....However, Rogers’ assertions to the contrary, both the cotton and the madder have been found elsewhere on the shroud. Both were specifically reported by famed microanalyst Walter McCrone. Other evidence of medieval fakery includes the shroud’s lack of historical record prior to the mid-fourteenth century—when a bishop reported the artist’s confession—as well as serious anatomical problems, the lack of wraparound distortions, the resemblance of the figure to medieval depictions of Jesus, and suspiciously bright red and picture-like “blood” stains which failed a battery of sophisticated tests by forensic serologists, among many other indicators. (Nickell 2005). Of course, the cloth might be 3,000 or 2,000 years old, as Rogers speculates, but the image on the cloth could date from a much later period. No matter what date is correct for either the cloth or the image, the date cannot prove to any degree of reasonable probability that the cloth is the shroud Jesus was wrapped in and that the image is somehow miraculous. To believe that will always be a matter of faith, not scientific proof. According to Garza, Otero told her "I love being challenged by agnostics. We believe our faith does not contradict reason. We should have an open mind in order to find truth. Our search for truth is guided by our faith." Not true, Otero. Your faith has blinded you to the truth. Reason would have you admit the shroud is one of many medieval forgeries that were part of the relic trade in those times. Your faith hinges on two threads alleged to be proof that the scientists who took extraordinary care to extract a representative sample from the shroud for testing were wrong and the believer's speculations are true. Few religious relics are as disputed as the 14-foot-long cloth. Many Christians believe it was used to bury Jesus and bears his image. Skeptics say it is a fraud and point to scientific tests – such as radiocarbon dating done in 1998 – as evidence. Wow! That's giving both sides of the story. On the one side you have many Christians who believe it's the burial shroud of Jesus and on the other side you have those silly skeptics who accept scientific tests as evidence. How retro of them to put their faith in science! Despite what Otero claims and Garza leaves unchallenged, you will not find what the shroud is all about by going to the exhibit at Otero's church, Our Lady of Guadalupe in Sacramento. For the real story, read Joe Nickell's 1998 account Inquest On The Shroud Of Turin: Latest Scientific Findings and his 2005 article on the sophistry of Dr. Raymond Rogers: "Claims of Invalid 'Shroud' Radiocarbon Date Cut from Whole Cloth." It seems fitting that the shroud hoax exhibit should be on display at the church of Our Lady of Guadalupe in Sacramento, which is named after the church in Mexico City where another hoax is on display for the faithful to venerate. Legend has it that Juan Diego, an indigenous ascetic mystic who had converted to Christianity, frequently walked barefoot the 14 miles from his village to church in Tenochtitlan (Mexico City). It was on these walks that he allegedly had several visions of the Virgin Mary. He allegedly brought to the bishop his cloak on which an image of the Virgin had been painted (Our Lady of Guadalupe, shown above, is the centerpiece of the Basilica of the Virgin of Guadalupe in Mexico City). Legend has it that the image was accompanied by roses, which were out of season and which skeptics had asked Juan to have the Virgin produce as proof of his claim that she had appeared to him several times. Many believe that the painting is of heavenly origin. Skeptics, weird folks that they are, considered all the evidence and concluded that the painting was done by a human artist and passed off as being of miraculous origin in order to win more converts to Christianity. 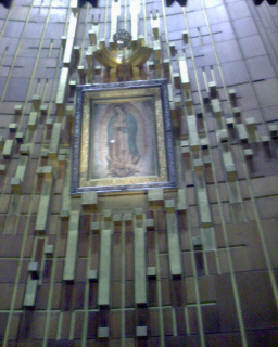 In 2002, a report on a secret study of the Image of Guadalupe was published. José Sol Rosales, an art restoration expert, found that the cloth "appeared to be a mixture of linen and hemp or cactus fiber" that had been primed with calcium sulfate. The paint used to produce the image consisted of the rather earthly combination of pigment, water, and a binding medium (Nickell 2002). The improbability of the story of Juan Diego (some doubt he even existed), his visions, and the miraculous painting have not deterred the faithful from belief. In fact, only a deep religious faith could account for the continued popularity of the shroud of Turin and the many sightings of the Virgin Mary, especially in the role of Our Lady of Guadalupe. The skeptic understands the desire to have a powerful ally in heaven, one who will protect and guide, console, and love you no matter what troubles you have here on Earth. The skeptic understands the power of relics to evoke strong emotions through magical thinking. The skeptic also understands how easy it is to find confirmation for almost any belief if one is very selective in one's thinking and perception. We understand how easy it is to see things that others do not see. Having visions also makes one feel special. Thus, it is not difficult to understand how many people see the virgin Mary or Jesus in the clouds, in a tortilla, in a dish of spaghetti, in patterns of light, or in the bark of a tree. What we won't tolerate, though, is being lied to by people who claim to be deeply interested in science but who will accept scientific evidence only if it is in accord with their prior beliefs. See also shroud of Turin and Our Lady of Watsonville. Damon, P.E., et al. (1989). Radiocarbon dating of the Shroud of Turin. Nature 337 (February): 611–615. McCrone, Walter. Judgment Day for the Shroud of Turin (Buffalo, N.Y.: Prometheus Books, 1999). McCrone, Walter C. 1989. "The Shroud of Turin: Blood or Artist's Pigment?" Acc. Chem. Res. 1990, V. 23. Nickell, Joe. (1993). Looking For A Miracle: Weeping Icons, Relics, Stigmata, Visions and Healing Cures. Prometheus Books. Nickell, Joe. (1994). "Pollens on the 'Shroud': A study in deception," Skeptical Inquirer, Summer. Nickell, Joe. (1998). Inquest On The Shroud Of Turin: Latest Scientific Findings. Prometheus Books. Nickell, Joe. 1999. Shroud Debunked—Again. Nickell, Joe. (2005). Claims of Invalid “Shroud” Radiocarbon Date Cut from Whole Cloth. CSICOP On-line. NIckell, Joe. 2009. Shroud of Turin Developments. Peterson, Jeanette Favrot. 2005. Creating the Virgin of Guadalupe: The Cloth, The Artist, and Sources in Sixteenth-Century New Spain The Americas - Volume 61, Number 4, April, pp. 571-610. Polidoro, Massimo. 2004. The Case of the Holy Fraudster. Rogers, Raymond N. (2005). Studies on the radiocarbon sample from the Shroud of Turin. Thermochimica Acta 425: 189–194. Schafersman, Steven D. (1998). "Unraveling the Shroud of Turin," Approfondimento Sindone, Year II, vol. 2. McCrone Walter C. "Red Ochre and Vermilion on Shroud Tapes?" Approfondimento Sindone 1998. Material evidence 'debunks myth' of Turin Shroud Well, maybe. It all depends on whether it is reasonable to assume that a shroud dated to the 1st century CE has a weave that would have been typical around the time that Jesus was wrapped and that Jesus was wrapped in a typical shroud. Anyway, the myth was adequately debunked when the shroud was carbon dated to the Middle Ages. Shroud of Turin Fake, and Scientist Says He Can Prove It Luigi Garlaschelli, professor of organic chemistry at the University of Pavia, has uncovered a method by which the shroud of Turin could have been created using only materials available in the fourteenth century.